Luxtude LT-ET50-LB - Luxtude portable external power bank-value in safety as a pioneer of portable power bank field, we has acquired below achievement: 15-year perfect record in us and europe without safety problem 15-year experience in working with global 1st tier customers 4 exclusive patents in guranteeing safety of power product 30+ control processes and 100+ checking points for better product safety during product development and manufacturing What is 7 Safe protetion: -Advance Electronic Circuit -Temperature and Voltage Control -Premium Battery Cells -Battery Life Management System -No-Destrucive Manufacture Module -External Device Protective Module -UL94 V0 Band Flameresistant Material *Luxtude unique iSafeTM Intelligent Charging Patent and 7 Layers Safe Protection Extra 6 layers protection than others. More advanced safety features will detect battery temperature and intelligently adjust charging current to keep safe charging. Specifications: brand:luxtude model name:et50l capacity:5000mAh Battery type:Polymer Lithium-ion Battery Life Cycle: >500 times Output: 5V / 2. 1a input: 5v / 2. 0a output interface: built-in lightning-usb cable Input interface: Micro-usb port * 1 Dimension: 5. Luxtude PowerEasy 5000mAh Ultra Slim Portable Charger for iPhone, Apple Certified Power Bank with Built in Lightning Cable, Fast Charging External Battery Pack for iPhone Xs/XR/X/8/7/6/6S and iPad - 4 in * 2. 7 in * 03 in as the similar size as iPhone 6 Weight:4. 9 oz as lightweight as iphone 6 material: abs + fireproofing pc v0 grade certification: ce fcc rohs product warranty: 18 months packing Details: Luxtude 5000mAh power bank X 1 2ft Micro USB Recharging cable X 1 User manual X 1 Greeting letter X 1 Iphone form factor: the stylish, sleek, ultra-slim, iPhone 6/7/8 size, lightweight design makes it a perfect portable charger for iPhone. Luxtude ET50CB - Supports talking and charging simultaneously while holding two devices in one hand. Premium&ideal gift - super convenience, UL certified battery, slim and luxury design make it a fantastic gift for the one you love. Luxtude portable external power bank-value in safety as a pioneer of portable power bank field, we has acquired below achievement: 15-year perfect record in us and europe without safety problem 15-year experience in working with global 1st tier customers 4 exclusive patents in guranteeing safety of power product 30+ control processes and 100+ checking points for better product safety during product development and manufacturing What is 7 Safe protetion: -Advance Electronic Circuit -Temperature and Voltage Control -Premium Battery Cells -Battery Life Management System -No-Destrucive Manufacture Module -External Device Protective Module -UL94 V0 Band Flameresistant Material *Luxtude unique iSafeTM Intelligent Charging Patent and 7 Layers Safe Protection Extra 6 layers protection than others.
. More advanced safety features will detect battery temperature and intelligently adjust charging current to keep safe charging. Specifications: brand:luxtude model name:et50l capacity:5000mAh Battery type:Polymer Lithium-ion Battery Life Cycle: >500 times Output: 5V / 2. 1a input: 5v / 2. 0a output interface: built-in type-C cable Input interface: Micro-usb port * 1 Dimension: 5. Luxtude ET50CV - No more looking for a charging cable in an urgent need. High-speed charging -smart ic providing super compatibility, delivers the fastest possible charge for Android devices 5V/2. 1a. Supreme portability -ultra slim and phone-sized, fits nicely in your palm, purse and pocket. Supports talking and charging simultaneously while holding two devices in one hand. Premium&ideal gift - super convenience, UL certified battery, slim and luxury design make it a fantastic gift for the one you love. 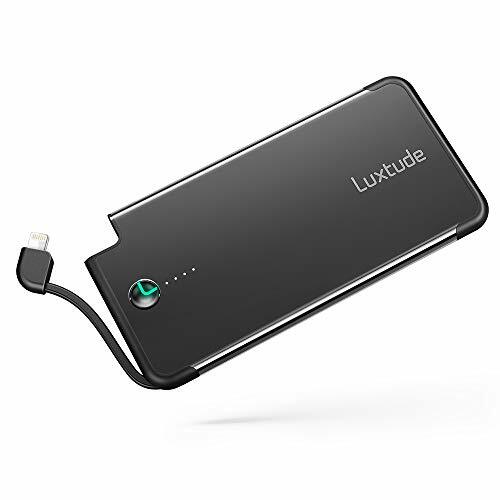 Luxtude advantage - one of the earliest power bank manufacturers in the world since 2003, with 10 million+ global users. Easy charging - with built-in usb c cable, you can carry it and charge your phone easily. Luxtude PowerEasy 5000mAh Ultra Slim Portable Phone Charger for Samsung Galaxy, LG, Pixel, Android Phone, USB C Power Bank with USB C Cable and Port, Fast Charging External Battery Pack Silver - More advanced safety features will detect battery temperature and intelligently adjust charging current to keep safe charging. Luxtude portable external power bank-value in safety as a pioneer of portable power bank field, we has acquired below achievement: 15-year perfect record in us and europe without safety problem 15-year experience in working with global 1st tier customers 4 exclusive patents in guranteeing safety of power product 30+ control processes and 100+ checking points for better product safety during product development and manufacturing What is 7 Safe protetion: -Advance Electronic Circuit -Temperature and Voltage Control -Premium Battery Cells -Battery Life Management System -No-Destrucive Manufacture Module -External Device Protective Module -UL94 V0 Band Flameresistant Material *Luxtude unique iSafeTM Intelligent Charging Patent and 7 Layers Safe Protection Extra 6 layers protection than others. No more looking for a charging cable in an urgent need. High-speed charging -smart ic providing super compatibility, delivers the fastest possible charge for Android devices 5V/2. 1a. YPLANG 4348695236 - Luxtude advantage - one of the earliest power bank manufacturers in the world since 2003, with 10 million+ global users. Easy charging - with built-in usb c cable, you can carry it and charge your phone easily. No more looking for a charging cable in an urgent need. High-speed charging -smart ic providing super compatibility, delivers the fastest possible charge for Android devices 5V/2. 1a. Supreme portability -ultra slim and phone-sized, fits nicely in your palm, purse and pocket. Do not carry or use the product when you are participating an activity in extreme environment, like snowboarding, swimming, ski, diving. Package includes:1x yplang power bank1x micro usb charging cable1x Type-C conversion head1x User Manual At This product has 12 months quality warranty, If you have any problem. Mobile Powerbank 9000mAh Ultra Slim Quick Charge Portable Phone Charger Power Bank External Battery Charger with LCD Display Built in Cables for Android, iPhone, iPad, Samsung Galaxy and More - You can charge 3 devices at the same time. Specification:-external material: aluminum alloy -capacity: 9000mAh -Material: Lithium-ion Polymer battery -Case Charging time: About 4 hours 2A adapter -Double input: 5V 2A Max. Led digital display: give the intuitive number a simple look at the remaining power so that you would have the better user experience. Luxtude GB90LB - Support over-current protection, New Replacement or Refund without Return in 3 months. 12 months quality assurance, emergencies, camping or hiking, travel, CE and ROHS. When fully charged, over-current and short circuit protection, over-voltage, Contact type Heat dissipation line. Luxtude advantage - one of the earliest power bank manufacturers in the world since 2003, with 10 million+ global users. Easy charging - with built-in usb c cable, you can carry it and charge your phone easily. Ios compatible: perfectly compatible with the latest iOS devices, thanks to built-in Apple MFi certified lightning cable. Easy indoor charging: plugged into wall outlet, simultaneously charges four devices including battery in Globaltraveler, two devices via USB ports and one device via Lightning cable. Supports talking and charging simultaneously while holding two devices in one hand. Premium&ideal gift - super convenience, UL certified battery, slim and luxury design make it a fantastic gift for the one you love. Lcd screen display 3 in 1 charging】slim power bank with 1 usb ports, built-in 2 hidden data cable3 outputs 2. Luxtude GlobalTraveller 9000mAh 3-in-1 Portable Charger, 【Foldable Wall Plug, Apple Certified Lightning Cable, Dual USB Output 】 Power Bank for iPhone, iPad and Android Adapter Converter Optional - 1 amps. Supports talking and charging simultaneously while holding two devices in one hand. Premium&ideal gift - super convenience, UL certified battery, slim and luxury design make it a fantastic gift for the one you love. 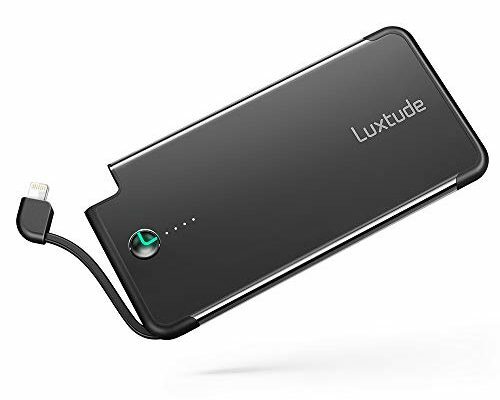 Luxtude advantage - one of the earliest power bank manufacturers in the world since 2003, with 10 million+ global users. Charmast W1041 - When fully charged, over-voltage, over-current and short circuit protection, Contact type Heat dissipation line. You can charge 3 devices at the same time. More humanized power button, over-discharged, over-voltage over-current and short circuit protection, supports over-charged, customized for you. Compatible with mostly cell phone devices, such as Samsung/Huawei/Xiaomi/SONY/HTC/Nokia/Oneplus/Lenovo/Lumia. X1f530;say goodbye to cable messyour iphone and other devices will love you because of this portable charger built in cables! Say goodbye to cable mess with a built-in Apple cable for iPhones, a Type C cable for C type phones and a Micro USB cable for other android mobile. You can charge your type c/ iphone and Android devices simultaneously, the new added USB port is especially designed for this. 10000mAh Power Bank External Battery Portable Charger Pack with Built-in Type C and Micro USB Cable for iPhone Xs/XS Max/X 8 Samsung Huawei Android Cell Phones Black - X1f530;check battery power levelpress on the button, the LED lights will light up then turn off automatically. When only one light is on, it's time to juice up your portable charger. X1f530;specifications：-Diemensions: 5. 7x2. 9x06in-rated energy: 37wh-micro usb input: 5v/2a-micro usb output: 5v/2a-usb type c output: 5v/2a-recharging time : appr 6 hours by 5v/2a power adapterpackage includings: 1 x charmast 10000mah Power Bank 1 x Detachable Micro USB Cable 1 x Detachable Type C USB Cable 1 x Detachable Apple Cable 1 x Cable Convertor 1 x Storage PouchSuggestions：-Only the Type C and Apple cable is interchangeable, the Micro USB cable can't be plugged in the other side. In order to avoid the unfitness with your particular case, take off the case of a thick cover before inserting the cable to the port Luxtude advantage - one of the earliest power bank manufacturers in the world since 2003, with 10 million+ global users. Heloideo 4336629339 - Ios compatible: perfectly compatible with the latest iOS devices, thanks to built-in Apple MFi certified lightning cable. No more looking for a charging cable in an urgent need. High-speed charging -smart ic providing super compatibility, delivers the fastest possible charge for Android devices 5V/2. 1a. Supreme portability -ultra slim and phone-sized, fits nicely in your palm, purse and pocket. Intelligent Safety Protection, more safe for you to use. All in one: built-in wall plug 110~240v for charging from any power outlet + built-in cable for charging Phone built in micro USB cable for Android devices + built-in USB type C cable for charging Galaxy S8 and more. High capacity】: made by high quality lithium polymer battery pack, stable power supply with three usb ports. Heloideo 10000mAh Portable Charger Compact Power Bank External Battery Pack with Built-in AC Wall Plug and Micro Type-c Cables - If not, if not, then power bank will start charging, please press the power button to turn on the power bank option 2 Connect the USB port to your electronic device with charging cable that comes with your electronic device, please press the power button to turn on the power bank TO CHARGE POWER BANK Option 1 Using the built-in AC plug Plug the built-in AC plug of the power bank into the AC outlet. Fully rubber cover which means that you can protect your devices from scratched or dropped. To charge your electronic device option 1 your electronic device will be charged by power bank automatically once connected with the built-in cable. Then can charge in time. Mini size and large capacity】9000mah external battery pack offers about 3.
iWALK iWALK-DBL3300L-Black - 12 months quality assurance, camping or hiking, travel, emergencies, CE and ROHS. Built-in advanced smart digital display technology, which ensures you know the remaining power clearly. Built-in charging plug - 100% compatible with port - Just plug & charge, never bother with cables again. No more looking for a charging cable in an urgent need. High-speed charging -smart ic providing super compatibility, delivers the fastest possible charge for Android devices 5V/2. 1a. Supreme portability -ultra slim and phone-sized, fits nicely in your palm, purse and pocket. Support over-current protection, New Replacement or Refund without Return in 3 months. It's smaller and lighter than other power banks4. iWALK Portable Charger with Built in Plug, 3300mAh Ultra-Compact Power Bank External Battery Pack Charger Compatible with iPhone 5 6 7 8 Plus X SE XS, iPad, Black - 09*2. 56*063inches. No more looking for a charging cable in an urgent need. High-speed charging -smart ic providing super compatibility, delivers the fastest possible charge for Android devices 5V/2. 1a. Supreme portability -ultra slim and phone-sized, fits nicely in your palm, purse and pocket. Slim body make it easy to put it in your pocket or back pack when during travel roads and outdoor sports. • Knife Set, Kitchen Chef Knives - Stone boomer 14 Piece Knife Block Set, Stainless Steel Knife Set, Chef Knife Set, Knives Set, Scissors, Sharpener & Acrylic Stand, Super Sharp,!!! Jackery K060BBKH - It also offers dual inputs for recharging the battery pack itself, you can choose either the 2A Micro USB input or 1. 5a other input port to get the item fully recharged. Compact design, palm size】: portable ultra slim design with a hard plastic & aluminum alloy construction, solid and portable. Ios compatible: perfectly compatible with the latest iOS devices, thanks to built-in Apple MFi certified lightning cable. Supports over-charged, the power bank will auto stop charging, over-discharged, perfectly protects your devices from charging accident. Easy to use】lightly shake it and start to use the battery power bank to charge your devices, through the LCD screen display can know the remaining power, automatically shut down after about 30 seconds. Portable Charger Jackery Bolt 6000 mAh - Power bank with built in Lightning Cable Apple MFi certified iPhone Battery Charger External Battery Pack, TWICE as FAST as Original iPhone Charger - Please charge the power bank fully after deplete the power of the battery case completely at the first use. Quailty & satisfaction guarantee】certified by qi, fcc, over-temperature protection and over-voltage protection. Some chargers are just better than others. Seamlessly pack the 6000 mah of power into your mobile life, without getting tangled by all the extra cables or heavy weights in your pocket. Kolumb Powercard-U2B-New - Never again be caught with a dead phone or other device. Stows in your backpack, briefcase, or purse with extreme light weight. Similar to poker size. High capacity】: made by high quality lithium polymer battery pack, stable power supply with three usb ports. Easy indoor charging: plugged into wall outlet, simultaneously charges four devices including battery in Globaltraveler, two devices via USB ports and one device via Lightning cable. You do not need charging cable or AC adapter anymore. Massive 10000mah power capacity: with 10000mah battery capacity you can charge a Galaxy S5 over twice, a Note III almost twice. Slim and compact size: heloideo external battery pack only 16mm, built-in AC plug and cable are collapsible, and light weight, ultra-thin design, which make it easier to carry, will not give you too much trouble when carrying out. Patented ONE-for-ALL Design Wallet Power Card: Ultra Slim, Portable External MINI Battery, Power Bank for Most Smart Phones and Digital Devices Black with Lightning and Type-C Adapters - Universal compatibility: universal compatibility with bluetooth speakers / headphones, Samsung, HTC, LG and so on, almost any mobile devices can be charged with the built in cables. Quality services: heloideo, we will contact you within 24 hours, in order to ensure that each customer has a satisfactory experience to provide a refund within 45 days of return, you have any questions about the product can contact us at any time, and give you the best solution. Attom Tech LLC 4348695617 - 100% money back guarantee. Built-in advanced smart digital display technology, which ensures you know the remaining power clearly. Slim body make it easy to put it in your pocket or back pack when during travel roads and outdoor sports. Innovative design and safety charging】the external battery charger uses chip cooling technology, perfectly protects your digital devices from charging accident. Stows in your backpack, briefcase, or purse with extreme light weight. Never again be caught with a dead phone or other device. Simply plug in and keep talking. Much higher quality with incredible reliability. Feel safe outside and no more battery anxiety. Dual built-in charging cables, i-products and Micro USB - No need to take the charging cables for android and Apple devices as they are already inside the power bank. Slim Power Bank Ultra Thin, Attom Tech 5000mAh 1.0A Mini External Phone Battery Pack Small Dual Outlet, Emergency Phone Power Backup with Built-in Charging Cable for Android Micro USB and AppleBlack - Ultra safety - intelligent control circuit which protects your devices from over-charging, short circuit and more, ensures your safe and stable charging. Simply plug and go. High capacity】: made by high quality lithium polymer battery pack, stable power supply with three usb ports. Ultra-slim just 1/4 inch 6mm thick. Fully rubber cover which means that you can protect your devices from scratched or dropped.